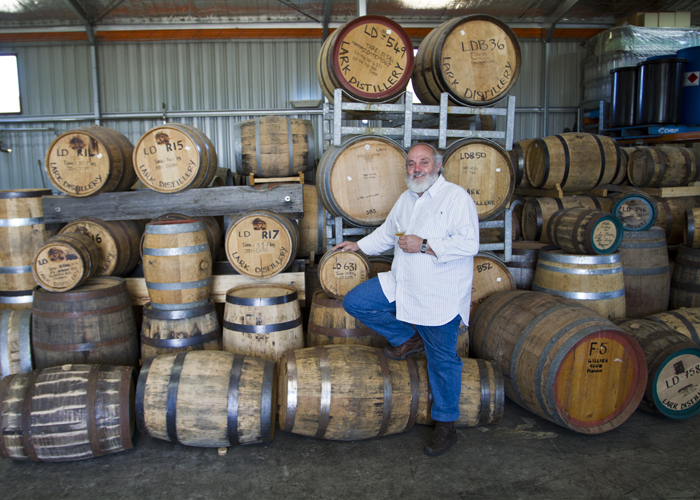 Bill Lark at his whisky distillery in Mount Pleasanton. Photo by David Lansing. Late yesterday afternoon I stopped in at Lark Distillery which is just a two minute walk from my hotel. It’s not really a distillery; it’s just the storefront in Hobart where Bill sells his whisky (along with Moo Brew which, funnily enough is a brewery owned by David Walsh, the math savant and owner of the Museum of New and Old Art). It was just about five in the afternoon and the place was packed. A local bluegrass group was playing. Bill was sitting at a table near the back door, drinking whisky and beer with his wife, Lyn, and one of the young guys who works at the real distillery out in Mount Pleasanton. They were listening to the music and sampling various Scottish single-malts (Bill has recently been hired to act as a consultant for a new whisky distillery in Fife in Scotland, so he said he was “doing my homework”). Bill has a real love of bluegrass music. He told me the story of how last year he’d been asked to give a presentation at a whisky symposium in Louisville, Kentucky, and one of the main reasons he agreed to go was so he could listen to some authentic bluegrass music. So now he hires a Tasmanian bluegrass band and has them come in to the distillery and it gives him an excuse to sit around with his friends and listen to the kind of music he likes and drink a little whisky and beer. I had a dram or two with Bill and afterwards he invited me to join him this morning out in Mount Pleasanton to tour the working distillery. We met back up at the Davey Street store around ten and Bill drove us out to the distillery which is about 15 minutes from downtown Hobart. I’ve been to any number of distilleries in Scotland, including some the biggest brands in the industry, and they’re all pretty modest affairs. But Bill’s place takes the cake. From the outside, you’d think it was just a large storage barn. From the inside, you’d think the same. There was a big industrial-looking pot where the “mashings” for that day’s whisky were being slowly turned, and a couple of miles of piping along the walls where the mash was cooled and transferred to a copper still, and a few other gizmos but that was about it. What you learn from touring a whisky distillery is that it’s a pretty simple process. You get some malted barley (Bill gets his from Cascade Brewery in Tasmania), add water and yeast, brew it just like a beer, ferment it, and then distill it. That’s about it. Oh, and then you age it in oak barrels and put it in a bottle. It seems so easy that I’m thinking of making my own whisky when I get home. I just need to come up with a good name for it. Any ideas? Hey, I kind of like Flaneur Reserve!